There aren’t many EL34 guitar amps on the market, so there aren’t too many reference designs I can use. I found a Class AB EL84 design on ax84.com that has a nice cathodyne phase inverter using 1/2 of a 12AX7. I’m expecting some classic clean british tone (Vox-ish) from this design. I had to recalculate the cathode bias resistor, and instead of the EL34s going to B+, I connected them directly to the taps on my output transformer. I assembled the film caps and resistors on a scrap of protoboard, then mounted it temporarily on the power transformer’s mounting screws. That giant blue thing is a 27Ω 5W resistor that I got in a ‘grab bag’ of parts from my local electronic surplus store – Addison. This is the cathode bias resistor. I don’t think this will be the final value, but I can take some measurements and tweak it as needed. This protoboard still has some real estate left over for my pre-amp, which is hunky dory. It was at this point that the unthinkable happened. 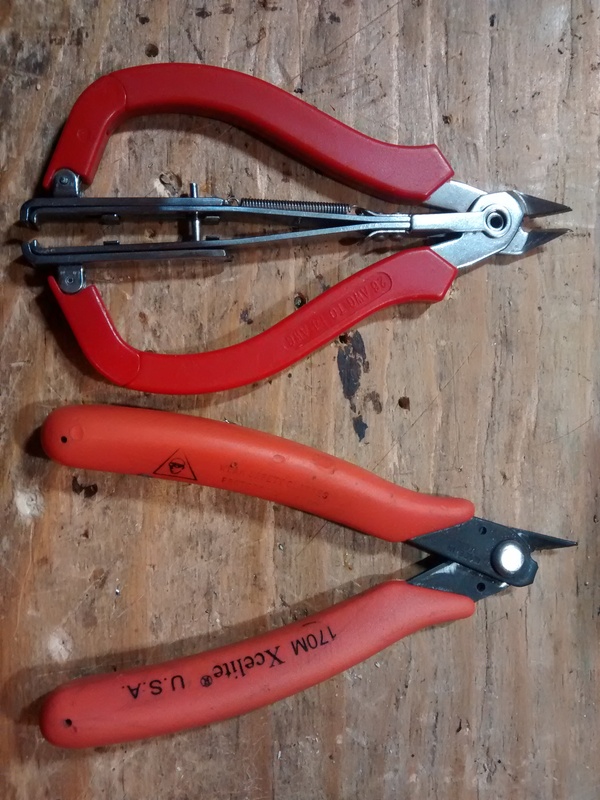 Both of my wire cutters broke. Looks like I have some shopping to do today.